It's 3am......: Swimming in December? 1st day of January and I seem to still be a little sick - not able to venture out today. Not really the best way to spend my last day off (or 1st of this year depending on how you look at it) but managed to get down to my computer for about 10 minutes to keep working on my photos from last week's day trip to Maine. Now - For those of you who get the chance, I highly recommend that after you finish spending money at the outlets in Kittery Maine that you wander over to Kittery Point and enjoy Fort Foster Park on Gerrish Island. It is a great place to take a walk - shoot some photos and just enjoy time with the family. I will be posting some photos from there later this week. Imagine my surprise when I walked into the park and saw this sign? 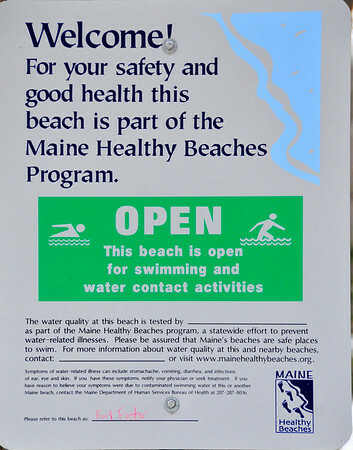 It was nice to know that the beach was open but I didn't really think I was going swimming or about to play any water contact activities.....although maybe this is where the polar bear club goes.